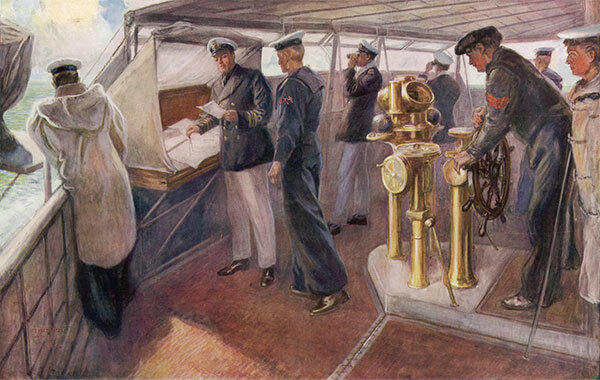 At the start of the 20th century, Britain’s Royal Navy was the dominant sea power in Europe. Over the years it had grown extensively to accommodate a thriving maritime commerce and the need to reap the produce of Great Britain’s overseas colonies. The rise of Germany, after its unification in 1871, presented an unwelcome challenge to the Royal Navy’s maritime supremacy. Kaiser Wilhelm II had become enamoured with the idea of projecting Germany’s military strength across the ocean, a notion which required a strong German fleet. 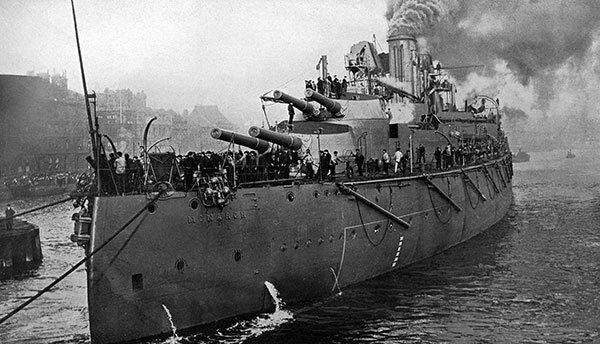 Germany’s Navy Act, passed in 1898, called for a dramatic increase in naval construction. It envisioned a German navy of nineteen battleships, which was extended to thirty-eight battleships by the following Navy Act of 1900. Of course, Britain was aware of Germany’s naval ambitions and responded by dramatically increasing the rate of their own battleship construction. This was reflected in the pages of The Illustrated London News, which frequently published articles relating to Germany’s naval expansion. By the start of the First World War, Britain had emerged as the clear victor in this “naval arms race”, boasting 30 dreadnoughts to Germany’s 20. Dreadnoughts, armed with ten 12-inch guns and powered by the latest Parsons turbine engines, were but one of several technological advancements which dramatically altered the nature of the war at sea. 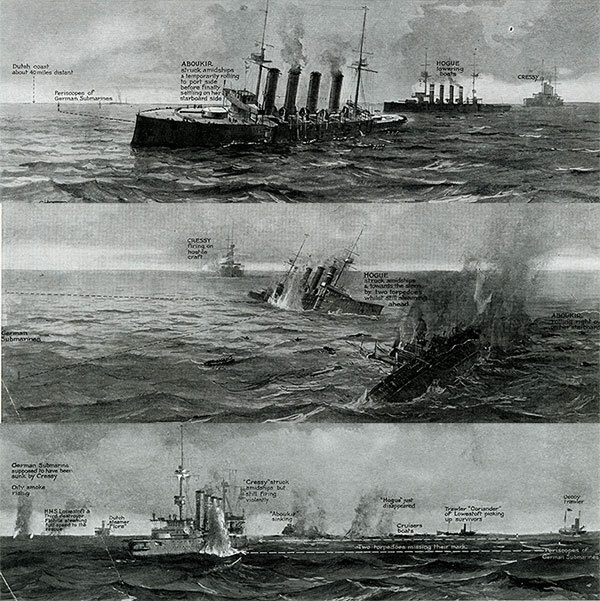 The Dreadnought picture here [right] from The Illustrated Sporting and Dramatic News is the HMS Monarch, built in 1912 she survived until the end of the war. Mines, Torpedoes and Germany’s early utilisation of U-boat submarines (Unterseeboots) made naval warfare far more treacherous for the Royal Navy. The HMS Amphion was sunk by a mine in the first few days after Britain declared war on Germany. In the next few months several British battle-ships in the North Sea and the British channel, including the HMS Cressy, HMS Aboukir and HMS Hogue, were sunk by U-boats. The Illustrated London News reported that the Aboukir had been in danger of sinking prior to the arrival of German U-boats. The U-boats took advantage of the hurried confusion of the three cruisers to launch an attack [illustrated below in three stages]. Despite these advances in technology and general naval strength both sides were relatively cautious about engaging the enemy. British naval commanders decided that instead of directly engaging the German Fleet, their strategy should be to prolong the economic blockade of German ports to cause increasing shortages and hunger for the German populace. A few naval skirmishes took place near Coronel, the Falkland Islands and Heligoland in 1914, but a full-scale naval battle would not take place until the Battle of Jutland in 1916. Torpedoed! the Fate of a Good Samaritan: The Sinking of the British Cruiser "Hogue"